Main material: teflon tube (currently dielectric loss minimum material), QA enameled wire, triode BD237, light-emitting diodes (leds), etc. 2.Won't produce independent of air discharge arc, with a good conductor near the top can produce arc around 1 mm, not because of electric shock injuries, very safe! 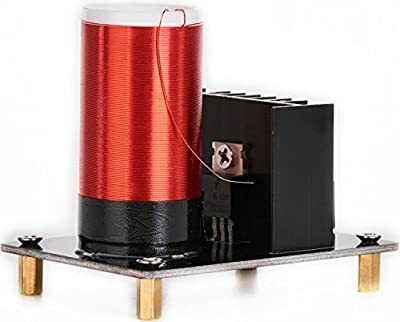 3.Advice when tesla coil work don't have to pull the tesla coil near the coil or hand, because the hand as a good conductor will let the coil form good loop, as for the tesla coil when current is bigger, the demonstration effect variation or not!Please pay attention!